Salads are healthy, right? Healthy greens, crisp vegetables, legumes, and crunchy nuts packed with omega-3's...all make for a delicious bowl full of superfoods. Then you pile on store-bought salad dressings filled with preservatives, additives, high cholesterol, sugar and fat...yikes! Making your own salad dressings ensures you have control over all of the ingredients that you are eating. 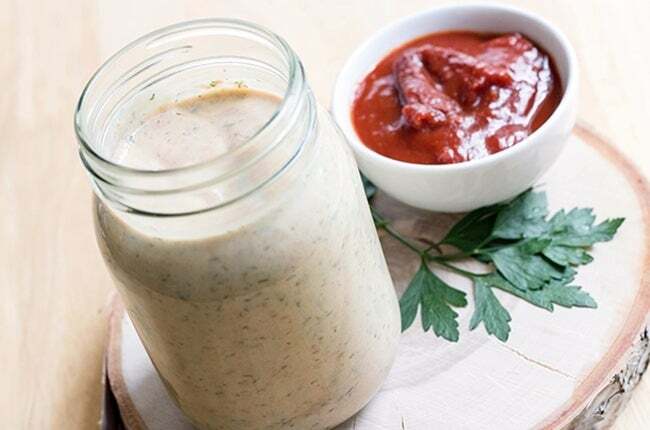 Plus, you make the dressings as you need them which makes them taste extremely fresh and multiple salad dressing bottles don't overload your fridge. Each flavor-packed dressing on our list comes together pretty quickly with only a handful of ingredients that you probably already have on-hand. Store these dressings in air-tight sealed containers or Mason jars and they will stay fresh in the fridge for about a week. That delicious Greek salad recipe isn't going to dress itself! 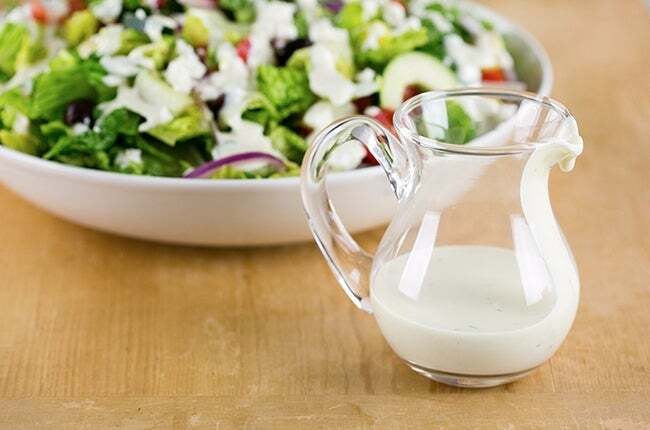 This Greek yogurt-based, zesty dressing clocks in at only 131 calories per serving, so drizzle away...guilt-free! Mix all of the ingredients together with a whisk or in a blender until smooth and creamy. A classic...and so easy to make your own version at home! 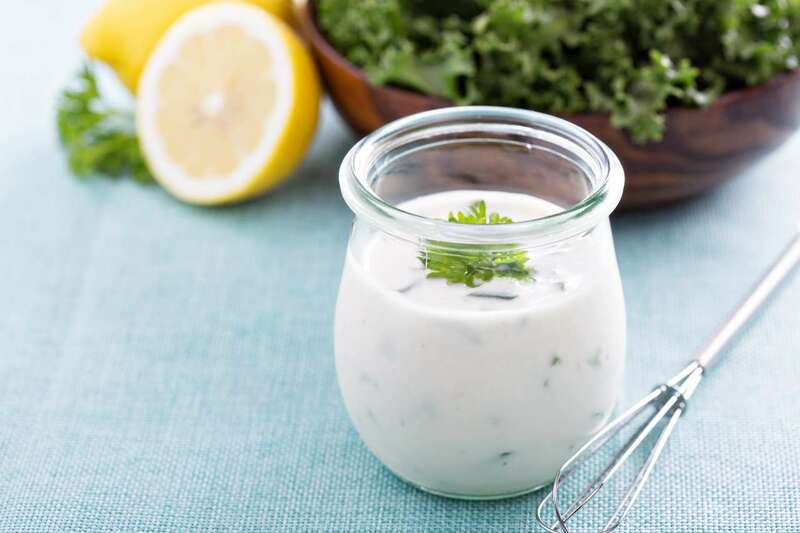 Try this creamy dressing on salads, as a sandwich spread, on burgers, in place of sour cream or as a dip for pretzels and veggies. In a medium-sized mixing bowl, whisk together the yogurt, mayonnaise, milk, vinegar, and dry mustard until incorporated. Gently stir in the blue cheese crumbles, and season with salt and pepper, to taste. If the dressing is too thick, add more fat-free milk 1 tablespoon at a time. Store in an airtight container for up to 1 week. Best tasting when it sits in refrigerator overnight before using, to let the flavors meld. This Sweet and Sour dressing is such a treat and pairs well with fruity salads. Try it on our Tropical Detox Salad that is packed with tropical fruits like pineapple, grapefruit, kiwi and mango! Using a blender or food processor, blend until all ingredients are mixed well or emulsified. 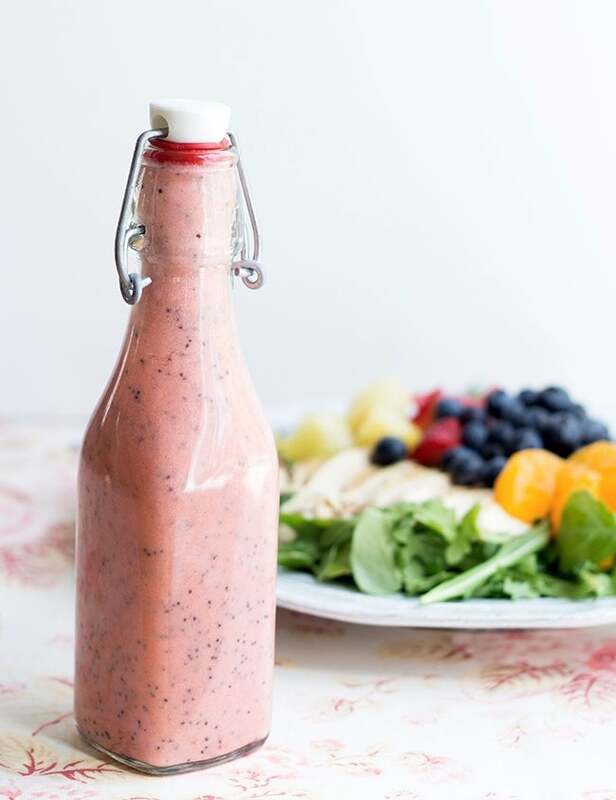 When summer rolls around, do you crave Panera's Strawberry Poppy Seed Dressing as much as we do? Now you can make your own version. Nothing beats the option of making your own seemingly store-bought recipe! Top our Copycat Panera Strawberry Chicken Salad with this and you'll be set. Combine all of the dressing ingredients except the poppy seeds together in a high-speed blender or food processor and mix until smooth. Stir in the poppy seeds and transfer to an airtight bottle or container with a lid (like a mason jar) and store in the refrigerator. You'll swoon over our lightened-up version of Light Chipotle Ranch Dressing. Only 50 calories for 3 large tablespoons. Use this spicy, cool ranch on your salads, toppings for burgers or as a low-cal dipping sauce. Place all ingredients in a food processor and pulse until smooth -- makes about 2 cups of dressing. Store in air-tight container in fridge for up to 1-2 weeks. 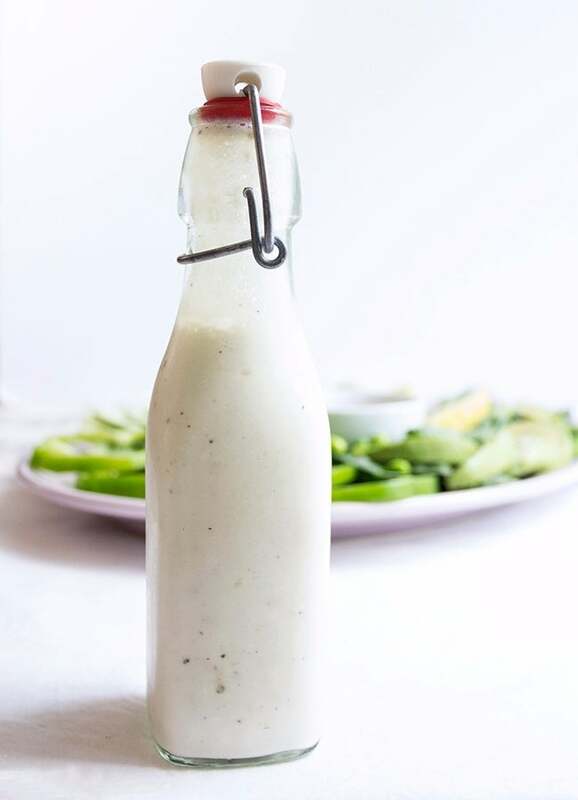 Our Skinny Buffalo Ranch Dressing uses a light yogurt base to keep things on the lighter side, and a kick of hot sauce to spice things up a bit! Your entire family will love this low-cal, spicy dressing. Try it on our Buffalo Shrimp Dinner Salad! In a small mixing bowl, whisk together the ingredients. Combine all of the dressing ingredients in a bowl and stir with a whisk until smooth. Makes 1 cup. Store in air-tight container for up to a week in the refrigerator. This Italian dressing recipe is lightened-up, zesty and the dressing your waistline has been asking for—minus all the preservatives and additives of store-bought. Try it with our Italian Chopped Salad recipe or your favorite salad. This dressing will soon become one of your go-tos! Combine all of the ingredients except the canola oil in a blender or food processor and blend until combined. With the blender or food processor on the lowest setting, stream in the oil slowly until the dressing is emulsified. A lighter version, homemade version on one of your store-bought favorites! You'll also want to try this quick dressing to bring zing and zest to our Skinny French Country Salad! Whisk all of the ingredients together in small mixing bowl until emulsified. Alternate instructions: Pour all of the ingredients in a mason jar, close the top and shake until emulsified. This easy dressing comes together in less than 5 minutes! You probably actually already have all the ingredients on hand! This pairs well with fruit based salads, or even tossed with fresh cut fruit. Try it with our Skinny Grilled Chicken and Fruit Salad! 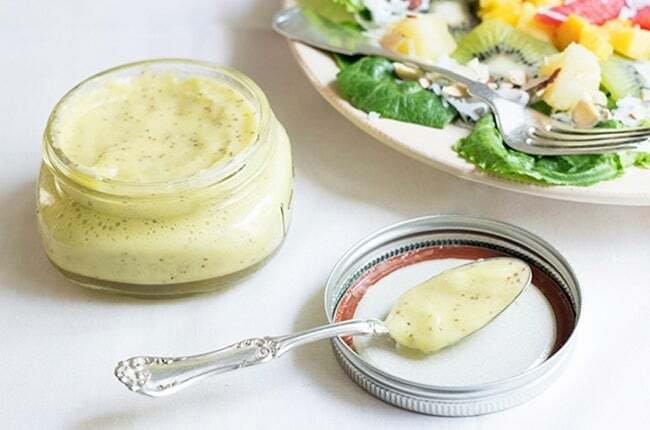 This summery dressing packs some zing with flavorful ingredients like red wine vinegar and Dijon mustard. This will easily become your new favorite vinaigrette—light and sweet, yet not over powering. Perfect for seafood salads. 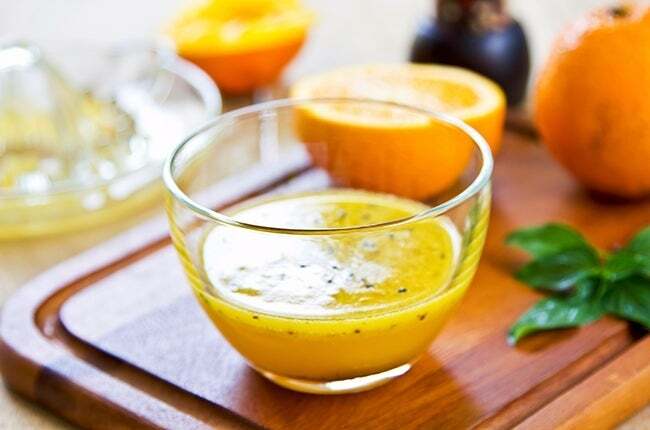 In a medium mixing bowl, whisk together the vinegar, orange juice, Dijon mustard, stevia, salt, and black pepper. Slowly whisk in the oil until the vinaigrette comes together (emulsifies). 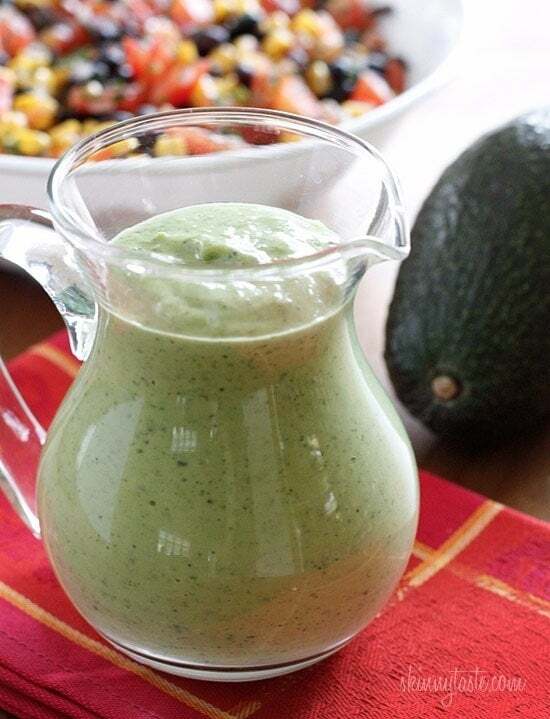 We HAD to include this delicious, creamy dressing with a slight kick from Skinnytaste! Enhance bland grilled chicken salads, as a mayo substitute on a sandwich, on Mexican Ranch Burgers or as a healthy dip! What's more? This dressing is low-carb, gluten-free, egg-free and vegetarian. Get the recipe here.